Benefits of desktop virtualization for businesses is a multi part topic. 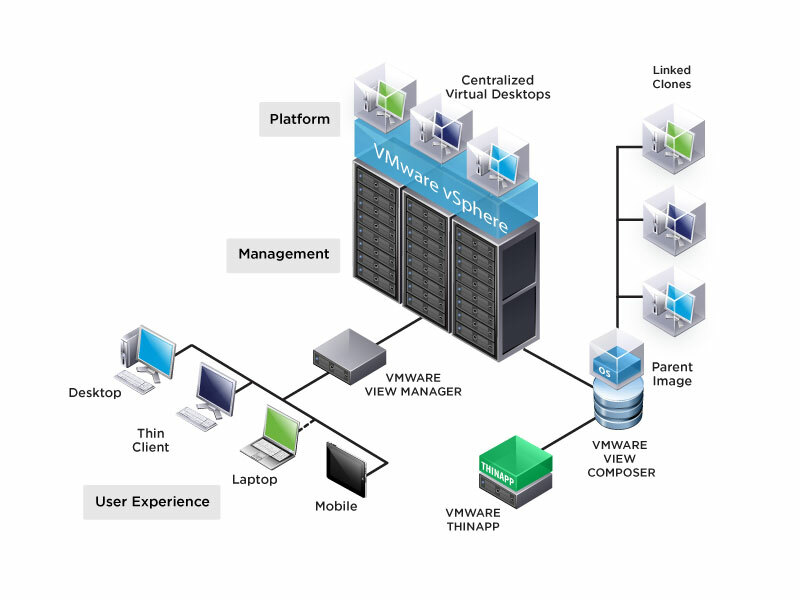 In this part, have written about the existing technologies for desktop virtualization. The first topic of this series on Benefits of desktop virtualization for businesses starts from this hyper-linked topic. We highly recommend to read that introductory article, else you will be unable to understand the basic thing – the series on Benefits of desktop virtualization for businesses is like a case study, it has proper headers; unlike flat blog articles. For a quick recapitulation, Virtualization technologies are based on different layers of today’s computers. Applications use interfaces and libraries (shared libraries), which are provided by the operating system to communicate with the hardware. The user interface or UI are exclusively bound to the respective application and also via the interfaces of the operating system of the physical computer. In Hardware Virtualization, compared to a non-virtualized system; the system architecture is extended by a hypervisor hardware virtualization layer. The hypervisor consists of the actual software to abstract the hardware or the VMs and the tools allows to manage the VMs. This is also responsible for coordinating the virtual machines and to control access to the hardware of the physical host system. One differentiates the areas of application server and desktop virtualization, as well as various technology options in the hardware virtualization. Thus own operating system for each VM is provided, however, always the access to the actual physical hardware is controlled via the host and all the hardware access is controlled. Desktop Virtualization in particular, is the combination of the hardware, as well as paravirtualization has proven to be successful and ended in the concept of desktop virtualization. This combination of hardware virtualization, for the purpose of consolidation in the data center, as well as presentation virtualization almost work for any form of a client, the VDI (Virtual Desktop Infrastructure) can show their strengths and their benefits. One of the biggest benefits of desktop virtualization is that, the desktops are no longer coupled to the terminals or clients. Thus, it is possible to access the same desktop or the same working environment from various clients. In traditional client / server architectures, operating systems, security software and applications are installed on each client or fat client. An employee in a company has the option to locally use the data on the server. The user can now make the decision either to store new or modified data on the server again and update or remove the changes locally and on the server. Because of desktop virtualization, any data are already present on the server, they are processed directly, the user is principal person for the taken decision. Since the complete logic of the virtual machine is located in the data center, you now have the opportunity to work with low-performing client, which enables new options in the client deployment. A so-called fat client is a client as we know it from the traditional workplace. So it is a full-fledged computer with its own hardware, such as hard drive, memory, graphics card and a processor. It is therefore to operate completely independently in the location by means of an operating system. It therefore has all the usual hardware components and peripheral connectors. A typical fat client is thus, for example, a Windows-based PC or a laptop. The concept of thin clients goes back to the terminal server solution, as they have already been used in the 1950s and 1960s. At the time, resources such as processors and memory were very expensive in comparison to the offered performance. Therefore Large computers, known as mainframes, were used by multiple users at the same time. The clients were connected to their host and were used solely to transfer the entries to the host and for the representation of the output from the system. The same concept to use today’s thin clients. Via the web as the historical model of the Terminal Server, the application data, user input as well as video and audio outputs are transferred between client and server. Thin clients are much smaller than fat clients and usually involve no option to save data such as hard disks or optical drives. The performance of thin clients can not be compared with that of a fat client, as they have no significant computing power and processing capacity. As desktop virtualization has the advantage that the terminals need no logic or complex computational tasks to compute themselves, a variety of other devices can be used. The only requirement for the use of desktop virtualization is a terminal device which has the compatibility with the used virtualization solution or the availability of Endsoftware by the manufacturer. Quite obviously from a smart phone to tablet, anything can work effectively to materialize desktop virtualization. This Article Has Been Shared 9196 Times! Cite this article as: Abhishek Ghosh, "Benefits of Desktop Virtualization for Businesses : Part 2," in The Customize Windows, November 24, 2013, April 26, 2019, https://thecustomizewindows.com/2013/11/benefits-of-desktop-virtualization-for-businesses-part-2/.